Show Us Your Ride Winner Chooses OffLeaseOnly Chevy Silverado! Congratulations to Josh and his family on their beautiful OffLeaseOnly Chevy Silverado! Josh heard about OffLeaseOnly’s customer appreciation contest on Real Radio 94.3 while loyally tuning into his favorite station. Josh couldn’t wait to get his OffLeaseOnly Chevy Silverado! He decided, why not, let me post a selfie with my car in hopes of winning a $20,000 OffLeaseOnly shopping spree vehicle voucher! His efforts were definitely worth it! Josh works extremely hard and his wife Nicole was beyond thrilled to see him win this generous prize. Let’s face it, $20,000 goes a long way at Off Lease Only! Josh had a blast shopping online prior to deciding which OffLeaseOnly Location he would visit. 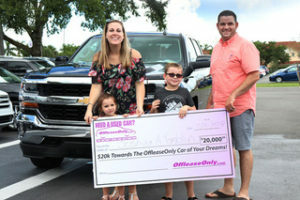 Living in Fort Pierce, his family is conveniently located to OffLeaseOnly Orlando as well as the south stores, so it was just a matter of finding the vehicle perfect for him. “At first I was looking at Toyota Tundras and Tacomas, but then I fell in love with this OffLeaseOnly Chevy Silverado!” exclaimed Josh. With over 50 OffLeaseOnly Chevy Silverados in stock ranging in price from $21,999-$47,999, all priced thousands below retail, Josh was ready to make his decision. Thousands of used cars, trucks, suvs and vans, all priced thousands below retail, is what you can expect to find when shopping at The Nation’s Used Car Destination! 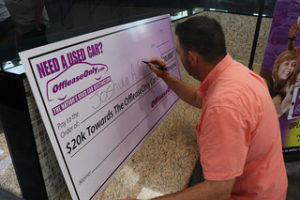 OffLeaseOnly’s claim to fame is offering customers a selection second to none and an incredible customer service experience. That’s why the dealerships are A+ rated on the Better Business Bureau, Premier Edmunds Five Star Dealer & DealerRater’s Used Car Dealer of the Year. Josh couldn’t wait to fill in his winning check! Do you want a new ride? The beautiful thing about OffLeaseOnly.com is you can literally do everything online prior to setting foot in the dealership! There’s no stress of negotiating price and no hidden fees. You can trade-in and trade-up into your dream car for thousands less than you would probably imagine. Get an instant quote on your vehicles value by clicking here. Online car financing is available for all types of credit and OffLeaseOnly also offers a five day/ 500 mile exchange policy for added peace of mind. Take your chances at winning weekly prizes by following OffLeaseOnly on Facebook, Instagram and Twitter. 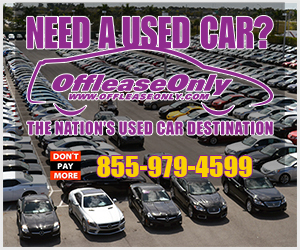 Want to stop by one of the Off Lease Only dealerships? 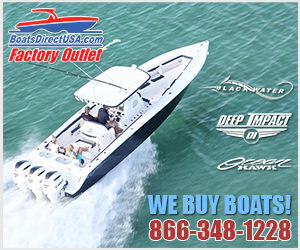 Simply click the banner below to get driving directions. 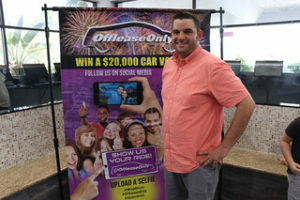 ← Previous Story OffLeaseOnly Congratulates $20,000 Car Voucher Winner! Next Story → Shop 5000+ Used Vehicles This Weekend at Off Lease Only!